Haneke has numerously been described as the “conscience” of European cinema, and the master himself exceeds in exhibiting such praise, in the work-of-genius that is: Cache. What makes Cache so special in particular, is Haneke’s intentional irony. Labelled ‘Cache’ (French for hidden) the film has an obvious link to its title, its main focus: a hidden stalker whom is interrogating Georges Laurent’s and Anne Laurent’s household by obsessively filming their lifestyle. However, Haneke says that films should offer viewers more space for imagination and self reflection and Cache would not be a Michael Haneke film if its sole purpose was to straightforwardly display an ‘anonymous’ stalker, following a family just for a scare. Haneke skilfully hides other possible interpretations of Cache well enough for his audience to fall dumbfounded. Hugely perplexed, us viewers attempt to unravel such typical-Haneke mystery. And consequently, it’s by result of such ambiguous direction that makes the reward of discovering the truth that extra bit more exciting and enthralling; Cache: a parable for France’s memory of la nuit noire. The irony of Cache is that Haneke does not attempt to hide the obvious correlations to the infamously tragic history of October 17th 1961. He instead misleads the audience by sending them on a false goose chase, he inflicts the poor viewer with sheer confusion and doubt and more confusion – the viewer questions themselves: who is the stalker? When instead they should be questioning: what is the threatening surveillance and lack of identity supposed to represent? The ‘unidentified stalker’, their lack of identity, the sheer darkness of the sinister drawings and disturbing suicide, all a metaphor to portray the vulgar, murderous officers in Paris who brutally victimised and murdered hundreds of innocent Algerian demonstrators in Paris, 1961. The sadistic officers concealed their identification in order to get away with murder, similar to how Georges in Cache hides behind his success to disguise his past - his harsh actions he made as a child responsible for the consequent, innocent death of Majid. The police officers removed their identification numbers from their uniforms to protect their identity, of which Haneke skilfully symbolises through the ‘enigmatic stalker’. 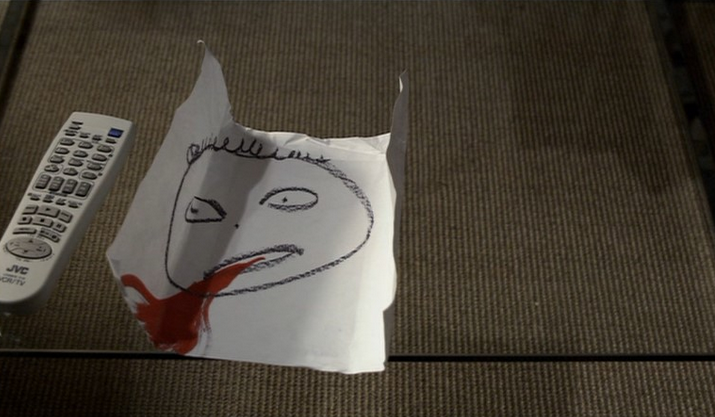 Haneke intensifies the obscurity of the plot, by flicking to an unknown boy who is dripping with blood – the unfamiliar boy bares strikingly grim similarities to the childishly illustrated drawings that have been accompanying the videotapes. Such puzzlement combined with occasional flickers of disturbance, builds tension and effectively puts the viewer on edge, as one sits in fear anticipating what could, happen next. Typically, nothing, and by nothing, Haneke does not disappoint us. Georges experiences a dream concerning Majid, which reveals his subconscious thoughts of him. Haneke implies that the entire situation is one big abstract representation of guilt, which is being dug up from Georges’ past and exposed in the present (symbolised through the drawings and video tapes.) The metaphor (of the tapes and drawings) represents a haunting burden being uncovered, which parallels with the murderous officers on the night of la nuit noire, whom tried to conceal their identity to protect their acts of murder. Haneke sheds light on the infamous tragedy that occurred in 1961 to remind people subject to the 21st century of such injustice and subhuman behaviour that underwent, urging people not to forget. 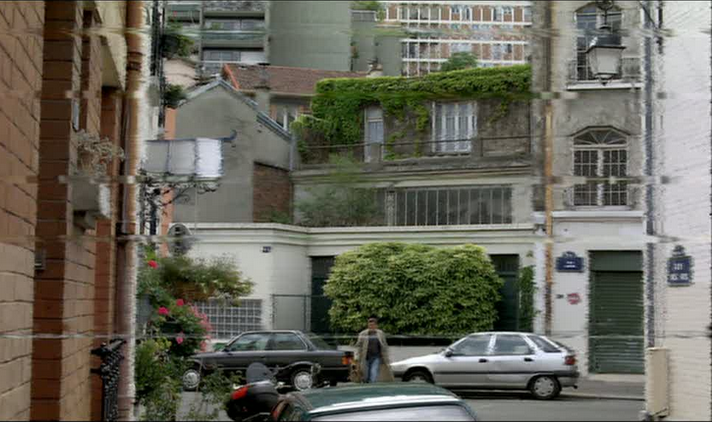 Cache retains a casual ambience even at it’s ending point, as Haneke naturally refrains from any sort of boringly-trivial, dramatic conclusion and leaves the film open to the viewer to unravel for themselves. Cache: another dreamy cinematic treasure of his - Haneke having made such hugely innovative, successful works already, still ensures that Cache does not fail in standing out amongst the rest.